An expedition to what's being called a lost world inside an extinct volcano in Papua New Guinea has discovered more than 40 new species, including giant rats, frogs with fangs and a new species of bat. The Bosavi wooly rat is as big as a house cat and has no fear of humans. ((Jonny Keeling/BBC)) An expedition to what's being called a lost world inside an extinct volcano in Papua New Guinea has discovered more than 40 new species, including giant rats, frogs with fangs and a new species of bat. Mount Bosavi in the rainforest of Papua New Guinea is an extinct volcano 2.7 kilometres high, with a crater one kilometre deep and four kilometres wide. Life inside has evolved isolated from the outside world for 200,000 years, the last time the volcano erupted. 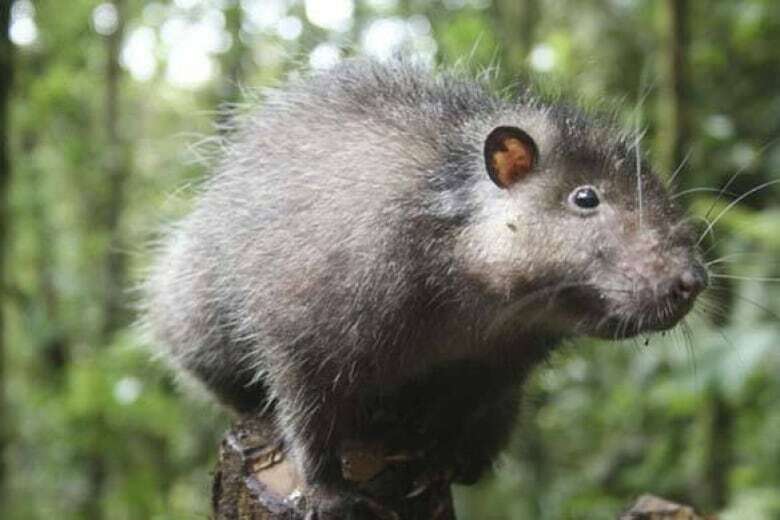 The silvery-grey Bosavi wooly rat, one of the biggest rats in the world, weighs 1.5 kilograms and is 82 centimetres long from its nose to its tail, as big as a house cat. Wildlife camera operator Gordon Buchanan said the rat had no fear of humans at all. "It just sat next to me nibbling on a piece of leaf. It won't have seen a human being before," Buchanan said. More than 57 species of rats and mice can be found in Papua New Guinea. The volcano's crater lacks big cats or monkeys as predators, which may explain how the rats evolved to be so big. The main predators inside the crater are giant monitor lizards. 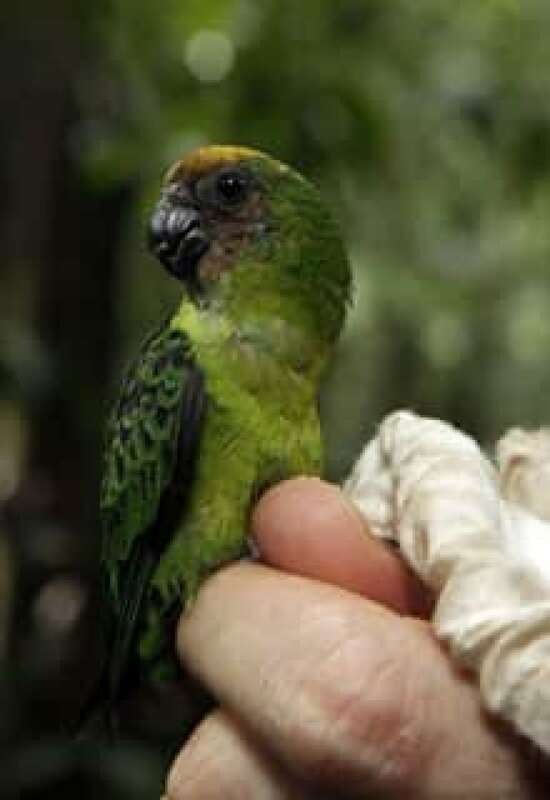 The buff-faced pygmy parrot, found by Jack Dumbacher of the California Academy of Sciences. ((Ulla Lohmann/BBC)) The crew also filmed the world's smallest parrot in the wild for the first time. The buff-faced pygmy parrot is about nine centimetres tall and weighs less than 12 grams. The expedition team included biologists from Oxford University, the London Zoo and the Smithsonian Institute. Members of the BBC's natural history unit filmed the exploration for a three-part documentary series called The Lost World of the Volcano. The team chose Mount Bosavi because animal life there is poorly understood, and similar ecosystems in Papua New Guinea are being destroyed. The country's rainforest, they said, is currently being destroyed at a rate of 3.5 per cent a year. There are extensive logging operations just 30 kilometres south of the volcano. New species discovered in Mount Bosavi include a frog with fangs, a camouflaged gecko, a spider that drops a net on its prey, and a fish that can make grunting noises with its swim bladder.